Herding for Health (H4H) is a community development activity that promotes conservation outcomes while supporting people living in rural areas to find their way out of extreme poverty. It does this by teaching community members to make use of what they already have – cattle and other livestock. While many view livestock as a threat to conservation and especially rangeland health, it is in fact through the correct management of livestock and unlocking their value in underserved communities that significant benefits for sustainable land use and biodiversity conservation can be achieved. Multi-functional landscapes are tangible working social-ecological systems. For example, in rural villages multiple landscape functions typically overlap and co-exist, such as residence, cultivation, free range pastoral livestock production, cultural and religious activities, tourism, and trading, while also providing ecological goods and services like water, grazing, grass-cover enabling rainfall absorption (‘water factories’), biodiversity, and water and carbon cycles. Management of multi-functional landscapes requires balancing ecological and social priorities and actions of multiple, diverse actors in seeking collaborative solutions that bring long-term ecological function and social justice. 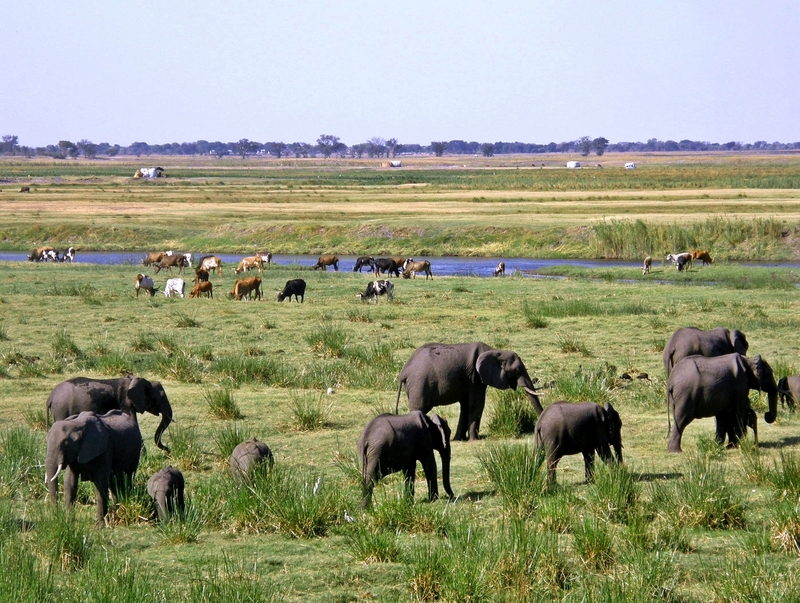 In addition, growing numbers of wildlife and water sparsity caused by drought, causes an increase in wildlife-livestock and human-wildlife conflict. Another contributing factor to the conflict is the severe and highly contagious viral Foot-and-mouth (FMD) disease which naturally occurs in free-roaming buffalo. For this reason, most of the remaining large protected areas in southern Africa are zoned as FMD infected areas. Cloven hooved animals, such as cattle and swine which communities living in and around conservation areas depend on as a source of food and income, are extremely susceptible to the disease. To minimise the impact of human-wildlife conflict there is both political and social pressure to effectively separate wildlife and livestock which result in significant negative consequences to sustainable conservation. H4H follows a holistic, community-driven approach to address challenges faced by farmers living in and adjacent to protected areas. The concept is based on the premise that with proper livestock management, land degradation can be reversed and the desired impacts, including the recharge of water resources and an increase in biodiversity resources, will be a reality. the development of policies that incentivize the adoption of sustainable, climate smart and wildlife friendly livestock management practices. It is a model developed and tested for over twenty years and revolves around skills development and deployment, farmer-driven participation, sustainable rangeland management practices, disease risk and food safety control as well as community-led rural development principles. Through the H4H programme, communal farmers, both men and women, directly benefit from learning new skills, increased income, and greater livestock and rangeland health. In addition to promoting gender equality, the project builds community governance capacity that improves interactions between communities and conservation entities and resolves barriers that stand in the way of transfrontier conservation area development. Recently approved and internationally adopted commodity-based trade standards for beef produced in Foot-and-Mouth Disease infected areas are used as a catalyst for this approach. At the same time indigenous knowledge, in the form of herding and kraaling, are brought together with new technology to enable regenerative livestock production and enhance social equity in the form of innovative training and enterprise development. 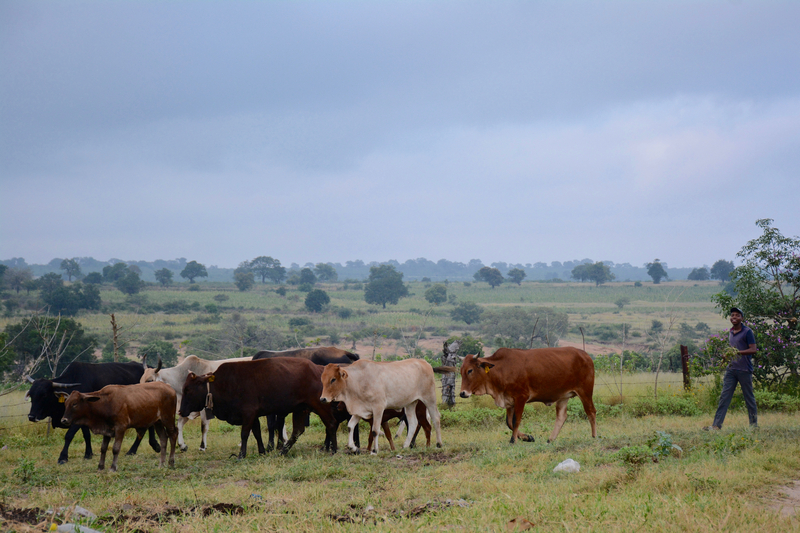 During 2017, Conservation South Africa, in partnership with Peace Parks Foundation, started supporting communal farmers in the Mnisi community, part of the Kruger to Canyons Biosphere Reserve, to engage in rangeland stewardship and climate-smart livestock production through the H4H programme. Following success with goals achieved and adaptations made through lessons learnt, the project is now being rolled out to other communities in and around transfrontier conservation areas in southern Africa. Eco-rangers are essentially the community-based facilitators of the restoration and red meat supply process, selected by the beneficiary community based on required criteria, and equipped with a basic set of skills to support the rangeland management activities within their community. These ecorangers are usually locals who have some experience of working with livestock, and is then supported with an increased suite of skills to be able to assist their community in sustaining the herd management and related activities, according to the type of grazing management system selected by the community, and ensuring a sustainable, traceable supply of livestock for the grassfed red meat market. reporting all cases of disease found within the herd. Peace Parks Foundation, through the SA College for Tourism’s Herding Academy, is assisting with the development of such skills by introducing a training programme that professionalises herding traditions. The accredited course trains community members to become eco-rangers or pro-herdsman. Topics of study include holistic planned grazing, animal production, primary animal health care, wildlife contact management, record keeping and auditing, community liaison and mobilisation, as well as tracking and security. The H4H project’s co-development focus on red meat markets through a social enterprise, Meat Naturally, sustains and expands the impact of the investment well beyond the life of the project. Livestock farming for meat production is the largest agricultural sector in South Africa, generating over R6.7 billion per annum. Despite the size of this huge industry, red meat consumption in South Africa outstrips production by 15%, making South Africa a net importer of red meat. Commercial farmers supply 95% of the red meat market in South Africa. Farmers on communal lands own 47% of the country’s livestock, but supply on 5% of the market. For communal farmers , access to markets, transportation, poor animal condition resulting in part from poor veld condition prevents smaller farming operations from participating actively and profitably in the red meat market. Red meat production primarily comes from the grassland and semi-arid shrubland regions of the country which historically would have supported extensive herds of wildlife and significantly overlap with two Biodiversity Hotspots, the Succulent Karoo and the Maputaland-Pondoland-Albany Hotspot. Livestock farming is a compatible land-use for biodiversity conservation, and when livestock lands are well-managed, the rangelands perform crucial water catchment and soil retention services that are essential for the broader South African population and economy. The H4H programme contributes to wildlife economy activities and provides technical support to implementation partners. 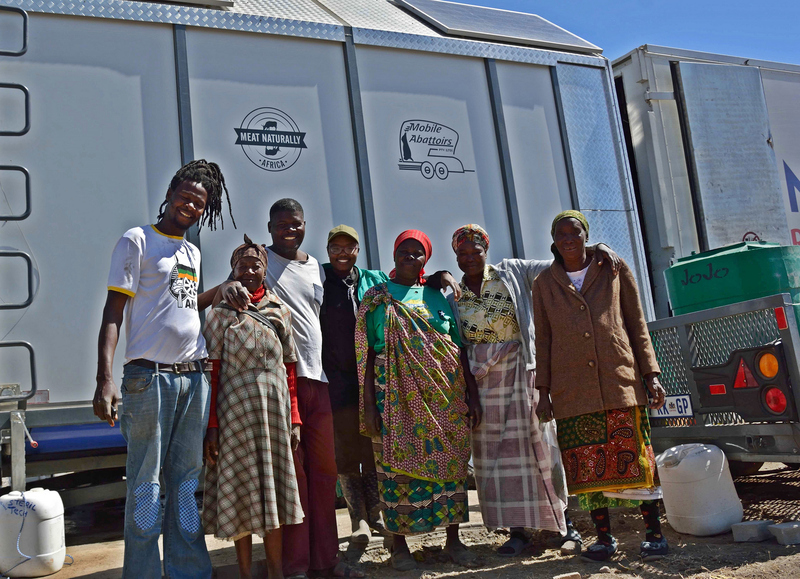 A mobile abattoir, developed through this project in partnership with Meat Naturally, has been piloted and will hopefully in the near future make year-round hygienic and safe meat production and trade possible. The objective is to fully incorporate commodity-based trade standards along the beef value chain in communal farming systems so that meat can even be sold outside Foot-and-Mouth Disease-infected zones, which will unlock significant value for local producers. The programme also ensures that conservation outcomes are still met despite improved market access by means of formal conservation and producer agreements with farmers participating in the Programme. As such, it has the potential to have the greatest conservation and climate change impact as a model for protected areas and rural development throughout southern Africa and beyond. CI, through Conservation South Africa (CSA), has joined forces with us in the development of the Herding for Health Programme. Social enterprise, Meat Naturally, is a critical enterprise in the Herding 4 Health Programme. 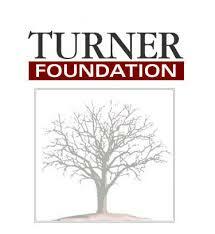 The Turner Foundation supports the Herding 4 Health project that form part of our Veterinary Research and Community Development Programmes.